If you’ve found this page, you’re likely not casually browsing the web for something to do. You are probably here because you’re having problems with your home building or remodeling contractor and the work that has (or hasn’t been) completed on your home. If you are at the stage where you are looking for an expert witness then it’s probably escalated beyond the point of remediation. We can help. DMB Construction is a local general contracting company owned by Mr. David. M. Bekus. Mr. Bekus is a licensed building inspector (RCS, ICS and HHS) and he has built many single family and town homes throughout New Jersey. With a certification in project management, construction methods, cost estimating and construction safety he has extensive experience and knowledge of the building trades. Mr. Bekus has over 30 years in the Construction industry. We have many years of experience helping homeowners with the complicated mess a contractor can leave behind. Below are some of short descriptions of some of the projects we have worked on as an expert witness in construction. Reports will make clear the alleged defects, concerns and costs to a lay reader and opposing party. Well written and convincing reports are instrumental in settlements, and if the case should go to court, a believable and honest expert is imperative. Though many experts may use a throw it at the wall and see what sticks strategy and many experts give an opinion without substantiating it- DM Bekus works hard to substantiate every opinion and make it fact. This is done by citing building codes, manufacturer’s instructions, industry standards, normal levels of care, examples of correct procedures- all to produce a report that meets the duty to the court of honest and impartial information. A midsize home builder sold a home that was previously flooded by damage caused by vandals. Upon the sale of the new home the builder allegedly did not disclose the damage and its extent to the buyers. DM Bekus was retained to document the damage to the home, describe proper procedures to prevent future mold growth and proper repairs, and provide expert opinion on the condition of the home. A cost estimate for repairs was provided along with discussion of the reduced value of the home due to the flooding. A home owner hires a contractor, often a contractor with a good track record, and the work is substandard. The relationship between the home owner and the contractor sours and then the homeowner is seeking compensation for needed repairs or completion. DM Bekus provides expert opinion, using well illustrated reports and citing the building code, manufacturer’s instructions and often the contractors own contract to document errors and deficiencies, not following manufactures instructions and workmanship not up to industry standards. Roofs, framing, ceramic tile, basements, sheetrock and concrete work are all common areas were errors are made. In most cases, a review of the contractors Home improvement license is done and any omissions and violations are flagged for attorney review. 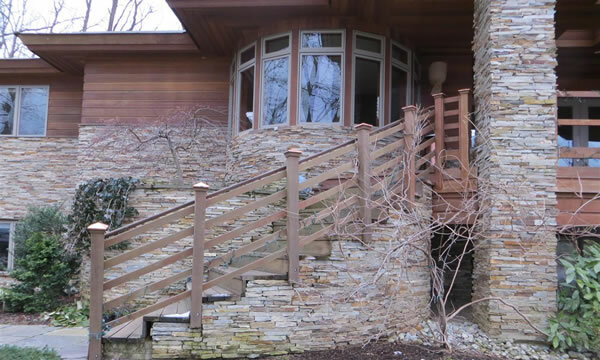 A million-dollar + home allegedly had the cultured stone installed incorrectly, some stones had fallen off, and the home owner became concerned. By documenting the installation practices and then using the building code and specific manufactures instructions the expert report clearly showed substandard installation practices and that the stone would have to be removed in its entirety and replaced. A high-end townhome development did not receive adequate funds from a large insurance company for damages from Super Storm Sandy. DM Bekus documented extensive damage to siding and windows to bolster the Associations case in mediation for additional insurance payments. A legal assistant was working at her desk, when a large cabinet fell off the wall and struck her, resulting in serious personal injury. DM Bekus documented the improper installation which breached the applicable standards of care. A large residential kitchen exhaust hood was field modified and during operation a portion fell off and struck the homeowner. DM Bekus was retained by the HVAC contractor’s attorney to provide expert opinion concerning the contractor’s culpability as he had only installed the duct work, prior to the installation of the hood, and the subsequent field modifications. The HVAC contractor was removed from the lawsuit. After a lightning strike set fire to a home were CSST piping (flexible gas pipe) was used. DM Bekus gave expert opinion on the relationship and responsibilities of the builder of the home and culpability of all parties involved. A homeowner contracted with Lowes to replace a kitchen and was not happy with the outcome. Both Lowes and the homeowner (and their attorneys) agreed to use an expert report by DM Bekus to ascertain what should be replaced, repaired or was acceptable. DM Bekus used the New Home Performance Guide lines, industry standards and over 35 years of experience to help create an equitable outcome. DM Bekus was retained by attorneys for an upscale town home development to review and opine on a previous Engineers report with issues on the installation of the roof and pavers. After a site visit and investigation, it was determined that systematic errors occurred in the roof installation of all units. Specifically: improper ice dam installation, improper roof/wall transitions, improper (and lack of) valley flashing. The paver installation errors were found to be indicative of improper sub base preparation and compaction, improper pitching of pavers for drainage, unsafe transitions at curbs and concrete walks. If you feel our services would be beneficial for your case please contact us. Whether you are a homeowner or an attorney representing a homeowner we are happy to work with you on your case. Building a Home in New Jersey? Here Are Some Things You Need To Know! Are you planning to build a home on your lot or property in New Jersey within the next year? Are you going to be hiring a general contractor, home builder or are you going to try and manage all of this on your own? Building a home is a complicated process with various permits required, building codes to abide by, the managing and organizing of sub-trades all while managing a time-line and your budget. This is no easy feat and there are many would-be homeowners in our area who’s home building dream plans go awry with contractor problems, budget problems, time line problems and/or poor quality workmanship. The most effective weapon in this process is knowledge and experience, knowledge on behalf of yourself to understand the basic concepts and processes behind the construction of your home so you can identify a potential problem before it becomes expensive or time consuming. You need the experience that only a seasoned and qualified contractor can provide. Get this right and the building process can proceed smoothly, usually meeting all of your targets and you’ll end up with a beautiful and well-built home for your family to enjoy. Get this wrong and this might be the first and last time you ever embark on the home building journey because the nightmare can ruin your finances and leave you with an unfinished home. DMB Construction Services is owned and operated by David M. Bekus. 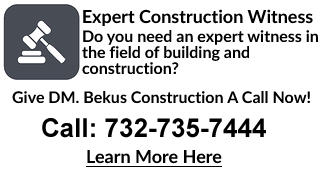 Mr. Bekus is a licensed NJ building inspector and has been involved with the local construction industry for the last 32 years. By bringing together extensive field experience with analytical capabilities Mr. Bekus has helped many homeowners solve complicated building and construction issues. This informational article is not meant to be legal advice. Mr. Bekus can be retained as an expert witness for construction related litigation between homeowners and their contractors and this is a highly personalized service, particular to your specific case with credible and detailed testimonial both verbally (in court) and written. #1. Your builder must have a builder license, not a home improvement license and it must be their own. You do not want to work with a contractor who is not licensed! #2. The two most important documents are the contract between you and your builder and the building plans for your home. Together they make the specifications for your project and guide the expectations of both parties. Often the contract and plans differ on details, have it made clear which takes precedent. It also helps to have someone review both to find those differences and resolve those differences before they become conflicts. #3. As importantly as what is included, you should also ask the builder to provide a list (in writing) of what’s not included, this especially applies to modular home construction. #4. Your builder should be able to provide references and addresses of previous homes built. It’s generally expected that you should be respectful when contacting these references and/or checking out their home. If someone is very happy with their home and the process they will tell you, likewise with the bad. #5. When getting multiple bids, please do not fall for a bid that is substantially lower than others. Good contractors get lumped in with bad, because homeowner’s hire contractors who shouldn’t be in the business to begin with and good contractors cannot compete for a project for the unrealistic price the unrealistically low bidder has quoted you. The majority of homeowner/builder issues can be boiled down to choosing the lowest priced bid… Remember that! #6. Ask your builder what their typical upgrade change order amounts are. Many unscrupulous contractors will count on overpriced change orders to make up for a misleading contract and drive the project beyond your budget. #7. Be sure the builder has the resources to do the work, not just on your house, but the other work they have taken on as well. It’s not uncommon for a contractor to take on way more work than they can handle and it usually ends up backfiring with corners being cut and deadlines not being met and a very unhappy customer or several. #8. It’s a smart idea to set payment schedules in your contract that are tied to verifiable mile stones, typically; the roof is on or the home has passed inspections from the town for items such as the framing or insulation. Be weary of front loaded payment schedules where the contractor is being paid for the majority of the work and materials before it’s been completed. #9. Ask about your new home owner warranty. Reputable builders will provide this information to you without you even having to ask. The home builder warranty is required by NJ law and a certificate of occupancy cannot be legally obtained without one. Generally, you will be provided with information from the warranty company as to what is covered and what is not. #10. Never assume that something is included if you don’t see it in writing in your contract or the building plans. If you are unsure ask. A good building contractor will be able to communicate this clearly to you verbally and in writing. #11. Once you have a contract and a budget, be aware that other costs may arise such as unforeseen circumstance with ground conditions, water tables, upgrades and/or changes. These issues can come up with any building or construction project and it’s important they are addressed and documented for both parties. #1. Many builders work with architects and you should involve the builder and architect from the initial stages of your planning. Getting these two experienced people together to collaborate on your home will alleviate many of the most common issues with construction and will keep everyone on the same page. #2. You should be able to set parameters for your budget. How important is cost vs. desire to you? People have very different budgets and tastes and it’s important to convey your tastes and means designing and building your home. When they know what is most important to you they will spend less time making revisions to your plans and material choices. #3. It can take an architect minutes to adjust your plans if you are clear with your communication vs waiting until later in the process which could potentially cost you thousands of dollars in additional material or labor cost. #1. Once plans and all documentation are ready it is brought to the town for approval. The amount of time this takes in New Jersey varies greatly from town to town. Right now with high volumes 6 weeks is not unusual at all to wait for town approval. Your contractor should be very clear about this process. #2. Once you’re ready to go your chosen builder should give an approximate start date for the project. It is not uncommon for weather and resources (often material or scheduling related) to alter the start date by a few days. Don’t be discouraged as this can be quite common. A good contractor will communicate any delays with you. #3. Once construction of your home is underway be sure your builder keeps you updated on progress, as many people with shore homes live some distance away and you might not be there to oversee and monitor progress. Good contractors are eager to show you progress because they know their payment is usually based on milestones they complete (as we mentioned earlier). #1. If work is completed as per your contract be sure you pay the builder promptly, it helps the builder continue to operate smoothly and it helps in the final quality of your home. There are bad customers for good contractors so it’s important not to fall into that category. You’ll have a more pleasant experience if no one feels taken advantage of. #2. Even if the builder doesn’t ask you to, it’s a good idea to try to get all your material and design selections done as soon as possible so they can be properly accounted for in your contract and your plans. #3. Be prepared for a few bumps in the road, home construction is not a perfect science. Between builders, architects, owners, suppliers, government and associations all coming together on the same square footage, there will be a few problems to solve along the way. Be sure the builder is working with you to solve them. If you’re considering the construction of a new home and need a contractor, if you’re already deeply involved in the process of building a home with a less than up-front contractor or if you’d just like to benefit from our years of project management experience then please give us a call or fill out our email form for more information.